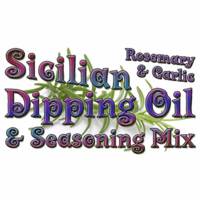 Sicilian Bread Dipping Oil Seasoning Mix by All Mixed Up, Ltd. Description: The perfect blend of Italian herbs, spices, garlic, and pepper to mix with olive oil or butter and serve with crusty bread. Ingredients: herbs and spices, garlic, salt, red pepper, soybean oil. Contains soy. Packaged in a facility that packages wheat, milk, soy, egg, peanuts, and tree nuts.